Snippets of My Life: Christmas Morning! We woke up real early to get ready for Church. Came home around 10.30am and the first thing we did were to open all our presents. We take turn for each of us to open up all our presents first and I get to open last because mine was huge. Diana looking for her presents. She was happy with what she got :) We also got her a huge suitcase for her to take with her to Germany. The most anxious moment for me. Wondering what he got for me! You know what I was saying here "why so much garbage in here"
Still have no clue what is in there except a whole bunch of paper! Keep digging!! See what I got!! Can you guess yet? A NEW CANON REBEL XSI CAMERA!!! This is my dream camera. I was hoping to get another digital camera from him but not this but I am so glad he got it for me as every food bloggers dream of having a DSLR camera like this. Now he said he must send me for some photography lesson in order to use this camera. Thank you Sweetie. Ok, time to make some waffles for breakfast! I'm so jealous... A successful chef, a great food blogger and now a soon-to-be professional photographer... Jealous tau!!! ps: You look good in the picture wei... Lost weight eh..??? Nice camera too. Can't wait to see more great pictures from you. Murphy did the same to Tina's present. But he used many wrappers and boxes. ahhh syoknyer.. nanti balik jangan lupa bawa camera tu eh.. kita boleh posing sakan hehehe..
Gert, you lucky food blogger, wife, mother, friend, you!!!!! I guess the best present doesn't have to come in a small box kan? Carlos has proven it. Zue, Carlos tu put all the garbage from the basement from bags of old clothing to garbage. Patut lah berat! 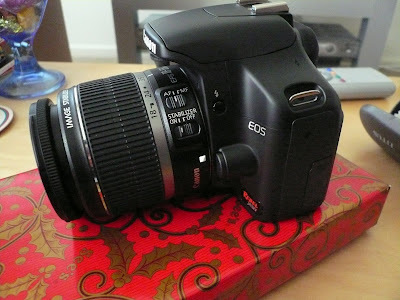 A DSLR camera for Christmas?! Lucky you! I've been wanting to get one myself, but I'm still thinking about it. Merry Christmas to you and family and Have a Happy New Year!!!! p/s Your daughter is really very pretty.. Must take after you! So darn lucky! Love that new sleek looking camera of yours! 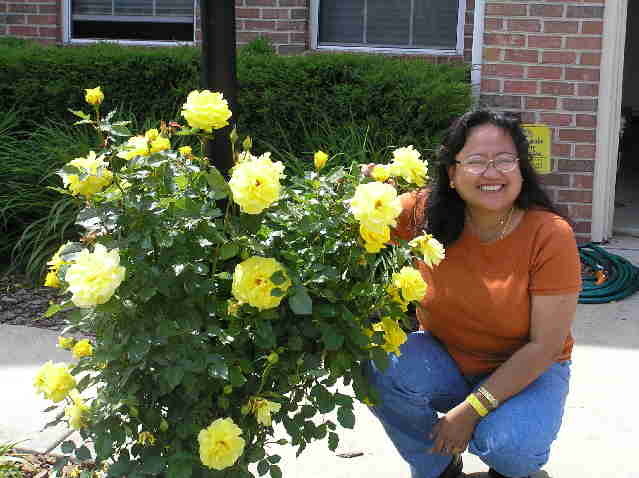 Mrs Nordin, thanks for stopping by at my blog. Yea, I am real lucky that Hubby got me such a wonderful gift :) By the way, Diana is my niece but she is more like a daughter to me. Anyway, Happy New Year to you too. Farina, he he.. thank you. happy new year to you and family , also i know you r going back home soon wishing have a great time bk home and . Merry Xmas and Happy New Year! Lovely gift you got, and have great fun with it. (Hmmm...no wonder some of my close-up shots are blur... Now I know I need a more powerful camera...hahaha)! Woohoo, Gert, I bet you were all tickled. A Canon Rebel DSLR!!! My coworker swears by it, takes the best pictures. Ydiana, Happy New Year to you too. I just got a new Canon dslr too! A 450D! Have fun with urs! Pigpig, you got a new DSLR too :) Looking foward to see all the beautiful pictures you take with the camera.